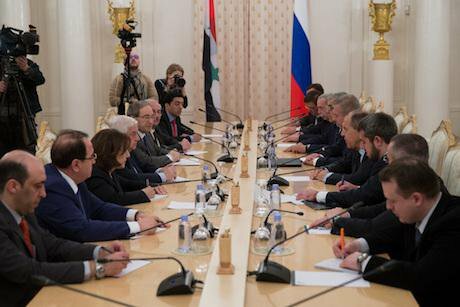 Russian Foreign Minister Sergei Lavrov (4th R) meets with visiting Syrian Foreign Minister Walid al-Moallem (4th L) in Moscow, Russia, on April 13, 2017. Xinhua/SIPA USA/PA Images. All rights reserved.Russia’s dramatic entry into the Syrian Civil War in September 2015 had many reasons but essentially left the Russians with the responsibility of being prime guarantor for how the conflict ends. This emerged more clearly during the January 2017 talks in Astana when the Russian delegation tabled a draft constitution for a post-conflict Syrian state which, not unlike the US guided constitution-making process in Iraq in 2005, is a curious attempt to impose an external power’s constitutional experience on a divided state. Accordingly, the draft constitution reveals more about Russia and its views of what’s best for Syria, than what the Syrians themselves might possibly contemplate. In evaluating the draft constitution, it helps to look at the Russian or Eurasian constitutional model, on which it is based. Eurasian constitutions share a preference for a strong central government and the Eurasian method is often called “parliamentary” constitution-making. At first glance a “parliamentary” style constitution might benefit Syria where the war has produced much division and left no single legitimate authority. But, cohesiveness and unity in the Eurasian model is generally less democratic as the strong central government it provides for is believed to protect the integrity of the state more effectively than western-style democracies. For example, Article 34 proposes a bicameral legislature. This includes a traditional People’s Assembly, elected via fair and frequent elections. However, in a break from the 2012 Syrian Constitution, the new draft establishes a “Territorial” Assembly to represent the various regions within Syria. This consultative upper chamber is not an independent institution and mirrors Russian ideas on constitution-making in fractious Kirghizstan which has a territorial assembly consisting of mostly presidential appointees. In Syria this body would support the executive but nonetheless give the Syrians more regional representation than they currently have and which could avoid a situation as could happen in Libya, Iraq and Yemen where politically autonomous regions could potentially see the dissolution of the state. In Article 55 the Russian draft also envisages an elected President with far-reaching powers as the “guarantor” of independence, sovereignty and territorial integrity. Moreover, the consultative Territorial Assembly is to be appointed by the president, who has constitutional obligations to maintain a dialogue with the regions and the president is to serve as the “mediator” for when disputes arise between the various branches and institutions of government. In keeping with the 2012 Constitution, the Russian document proposes relatively long seven-year terms for the executive – the same as the term for the Russian president. Thus, the Russian draft suggests less concentration in a central authority than the Syrian regime would like but equally leaves open the degree of decentralization which is not definitive in the text. In fact the exact relationship between the national and local administrations is to be subsequently determined by law. Further, Article 15, Section 2 recognizes a Kurdish Cultural Autonomy (also mentioned in Article 4). It is an unspecified term, but one likely interpretation suggests that cultural autonomy in the Eurasian constitutional model is like the Jewish Autonomous Oblast in Russia, which affords “significant linguistic and religious autonomy but little political autonomy.” The draft suggests Kurds may be granted greater autonomy than other regions, but ultimately leaves the question of decentralization for interpretation, future negotiation and legislation. But it is on questions of how to reflect Syrian identity that Russian design is most evident. For example Article 3 of the Syrian 2012 constitution states that the President shall be Muslim and that Islamic jurisprudence is a major source of legislation. However, in the Russian draft Article 3 says the “state shall respect all religions…and ensure the freedom to perform all the rituals”, omitting Sharia law altogether. It seems self-evident that a shift to a more religiously pluralistic and secular government would be beneficial if only to accommodate religious minorities in the state. However, given the historical centrality of religion in Syrian identity a complete shift to a secular state is unlikely, regardless of the outcomes of the conflict. Moreover, the 2012 Syrian constitution, Article 4 also describes the official language of the state as Arabic. However, in the Russian Draft, Article 4 allows using Arabic and Kurdish languages equally in the context of a Kurdish Cultural Autonomy to be determined by law. Further, a second official language (in addition to Arabic) may be determined locally by referendum. This is clearly an attempt to accommodate the Kurds and other minorities in a future Syrian state. Russia’s draft Syrian constitution was designed only as a “guide” for the negotiating parties in Astana as admitted by Stanislav Gadzhimagomedov, head of the Russian delegation. He also cautioned that the question of giving any administrative unit, including areas of Kurdish concentration a status of autonomy, must be decided by all Syrians. The critical question here is how Syrians will take these decisions; whether through victory on the battlefield or some negotiated settlement or even a national dialogue or more formal constitution-making process. Also clear in the Syrian conflict is the direct interest by Turkey and others in future state configurations that could impact their own politics. Regardless, Russia’s draft Syrian Constitution draws on its own constitutional experience and reveals what it views as the most stable option for Syria moving forward. Altogether, it’s an extraordinary document and suggests that Russia is ready to mediate an end to the conflict, finally. Now they just have to get the Syrians to agree.